Our special thanks to the following names: Cynthia, Mike, Freda, Michael, MyFTP, Kathleen, Albert, Joe, Jay, David, Alan, Brad, Helen, Chiam, Pam, Hanorah, Paul, Barry, Anthony, Allison, Peggy, Ian, Marc, Nicko, May, Fiona, Asher, Tina & Kay and a decidedly long list of many others just as deserved as these are real people who have all carried through on their responsibilities towards their children and the children of others. The list of others who have assisted may never be counted or named but their actions will never be forgotten through their dedication to never again permit anyone to experience the horrors so many of them have. No amount of thanks can ever be enough to express our gratitude to all these people. "Something you will never see: an atheist boarding a plane with a bomb strapped to him, waving a copy of On The Origin Of Species, before he blows himself up in a violent attempt to further his cause." David Nicholls. The nature of our initiative says it is logical for us to not link out but for links to point to us. You can select from the following or make your own arrangements. We prefer the following when linking to us. You may like to make use of one of the following images as you link to us. 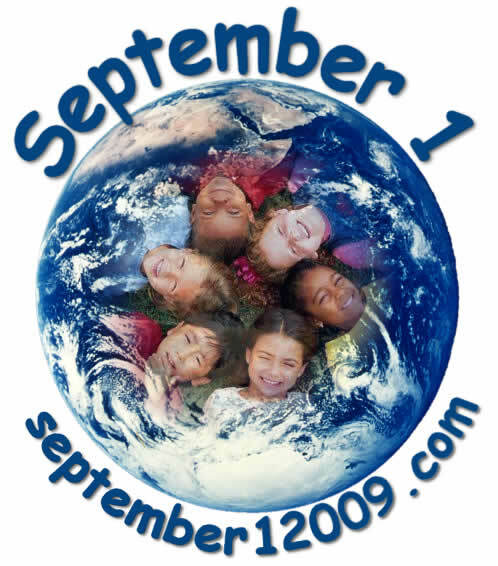 "The Global Supporters of September 1"
and the children of this generation and those yet to come.